It’s been two months since I had my first rock climbing experience with the Woman Climb event at Manchester Climb Centre. During this taster session, I discovered that I wasn’t very good at rock climbing, but I did really enjoy it, and I wanted to get better. So, I signed myself and my other half up for a Beginner’s course, thinking it would be something nice we could do together. 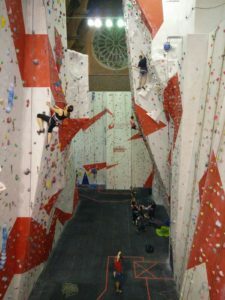 The Beginner’s course at Manchester Climb Centre is normally £90, but because I signed up from the Women Climb event we got a discounted rate of £60. This cost covers three lots of two hours tuition, across three weeks, and gives you everything you need to be signed off as an independent climber. Week 1 – We started off learning the knots required to attach the rope to the harness for the climber and safe belaying technique. Most of the lesson was spent checking our knot and rope work, while we took it in turns to climb and belay each other. It was a really nice activity as a couple, as there’s tons of trust involved! I still didn’t make it to the top of any walls, but Arran seems to have taken to rock climbing like a pro. Week 2 – This week we continued to practice knot and rope work, but also had to practice falling, both being the person who falls, and being the person belaying as someone else falls. The idea is that you know what it feels like, and also know that you’re safe. This week I reached the top of my first ever wall, and despite still being the worst in the group, I was just happy that I was making progress. I definitely enjoy that it’s something we can do together, and it’s nice to know Arran trusts me enough to throw himself around and fall off all the time! Week 3 – For the last week we got a lot more climbing in, and we were tested on everything we had learnt. We also learnt about different climbing techniques, and the names of the different holds. It turns out that Arran is a dynamic climber (fast and fancy) while I’m more of a static climber (slow and cautious). By the end of the session, we were all certified independent climbers, and I even got to the top of another wall! The Beginner’s rock climbing course was really good for us. The teachers were great, and no one made me feel bad for not being able to get to the top of any walls for the majority of the time. There was lots of focus on safety, and it made us really confident to go it alone. Now we were all qualified, we decided to get our own kit. You can rent kit from the climbing centres, but after 10 sessions you may as well have bought your own, so off we went to the shops. Arran quickly settled on a Black Diamond Momentum harness which he finds super comfortable, and some Simmond Edge climbing shoes. The shoes are slightly more advanced that what most beginners might go for, but he seems to have taken to climbing very quickly, and as he’s likely to be trying much more difficult routes than me, we went straight for the more advanced climbing shoe. I had more trouble finding kit. I liked the look of the Black Diamond Primrose harness online, but Decathlon choose not to stock the harness above a medium. After storming out of the shop shouting ‘fat girls can climb too’ at a sales assistant, we headed to Go Outdoors in Stockport. Here I enlisted the help of a member of their staff who knew about climbing gear, and he restored my confidence and helped make sure I found kit that fitted and I felt comfortable in. I’m so pleased we made the trip to this store, as without their help I might have lost all hope. I ended up with the Climb X Pilot harness, and Scarpa Velocity shoes. Even though you’re supposed to get shoes that are really tight, I opted to get a size bigger than my regular shoe size to make sure I felt comfortable. Again, I’m not going to become an advanced climber any time soon, so comfort is more important to me than my toes being squished. One week after completing the course we decided to make Tuesdays our regular rock climbing evening. 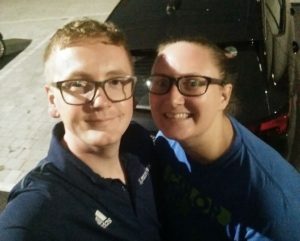 I really enjoyed our first solo outing, I solved the biggest 4+ problem I’ve ever done, and was super excited about how much more confident I had become. 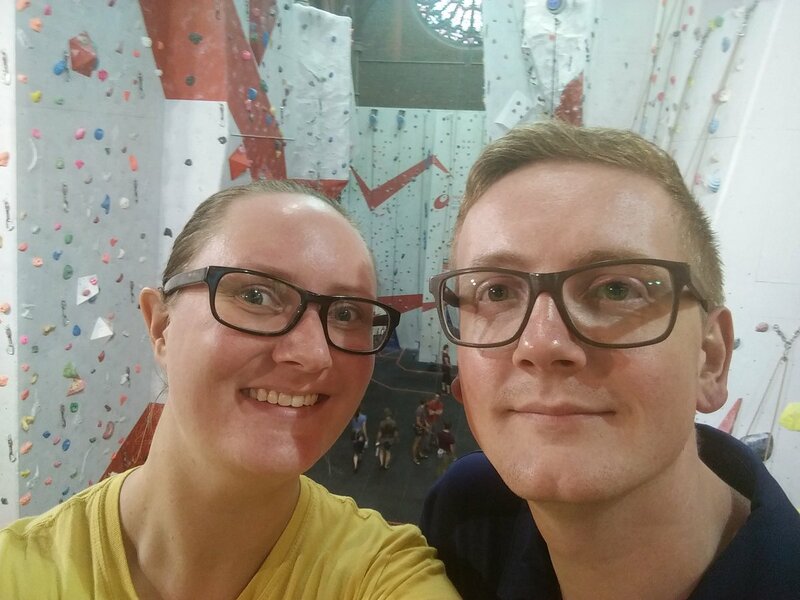 For our second week we teamed up with a friend who had organised a DigiClimbMCR meetup, so it was nice to spend some time with some other climbers. Overall it was a bit of a down week for me in terms of achievement. I had a few really tough walls where I got stuck very quickly, and it was so exhausting getting over certain bits of the climb, that I was too tired to go any higher. Our third week went much better. I was back to making progress, and solved my first ever grade 5 problem. Arran was still flying, and is already solving grade 6a problems. He also wants to try lead climbing, which terrifies me! Last week was our fourth session, and we’re still both really enjoying it. Arran is progressing super fast, solving a 6b problem for the first time, and I solved TWO grade 5 problems, including one I had previously tried and failed at, and two other 4+ problems I hadn’t been able to do in the previous sessions. We’re loving rock climbing, and we’re definitely keeping at it! 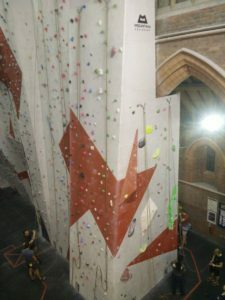 fab blog… so glad that you carried on climbing after that first event with us, and its great to hear your experiences as a new climber and what kit you went for!